My Congressman is at it again. 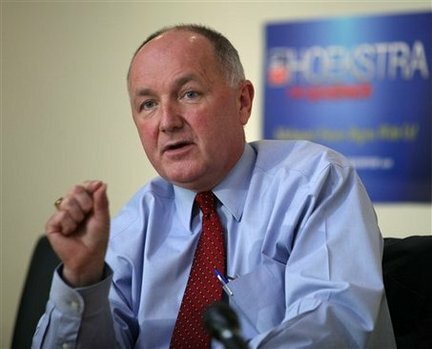 Pete Hoekstra, also a candidate for the Republican nomination for governor, sent out a fund raising letter in which he uses partisan attacks in response to the attempted bombing in Detroit last week to raise money. (A full copy of the letter is also available here). I’ve already noted the absurdity of Hoekstra’s attacks considering that the Democrats have a better record in fighting terrorism than the Republicans. In this case, it was the Bush administration which gave the visa to the person who attempted the bombing, and it was the Bush administration which released those who planned the attack from Guantanamo to instead be placed in an art therapy rehab program. Hoekstra’s argument in the fund raising letter makes even less sense considering that the governor has little to do with fighting terrorism. He also better be careful in distorting the records of Democrats as he does in his letter. Someone might ask him about his vote on June 24 against funding for the TSA, including funding for explosives detection systems and other aviation security measures. In addition to blocking funding for the TSA, a Republican is also responsible for blocking the appointment of a TSA chief. “It is extremely disappointing that the congressman would us a potentially tragic incident to raise money for his political campaign,” said Snyder spokesman Jake Suski. “In these troubling times, words can’t describe how sad it is to see an attempt to politically capitalize on a failed terrorist attack just three days after it happened. Perhaps the fact that Hoekstra is trying this, despite such a weak hand, shows how he really lacks any meaningful arguments as to why anyone should vote for him for governor. In 2004 Karl Rove helped George Bush get reelected by using state amendments opposing gay marriage to get out the vote. The Republicans campaigned as defenders of traditional marriage. Now Karl Rove is doing even more to defend traditional marriage–divorcing his wife after twenty-four years of traditional marriage, freeing himself to enter himself into another traditional marriage. There is no word as to whether his marriage was destroyed because of the existence of gay marriage. 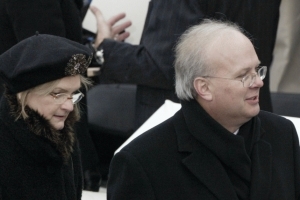 Karl Rove’s dedication to traditional marriage is even stronger. He was divorced once before (again no word if this was caused by the existence of gay marriage). This means that Karl Rove can now demonstrate his support for traditional marriage by getting married for a third time.